It is officially September! Kids are back to school and parents are back to school shopping. Back to school shopping means lots of spending – more spending than Mother’s Day, Valentine’s Day, Easter, and Super Bowl combined! A survey done by the National Retail Federation found that last year the U.S. spent over $83 billion on back to school shopping, this includes students K-12, as well as college and graduate students. This year it is estimated that the combined students will spend over $82 billion. Online shopping has become the more popular resource of back to school shopping for students K-12 compared to retail stores. College and graduate students spend slightly more money in retail stores compared to online stores. It can be pondered that K-12 shopping is mostly done by parents and online shopping is easier, whereas college and graduate students do their own shopping and can do so on campus more easily. Surprisingly college and graduate students are only spending on average $250 more than K-12 students on back to school shopping supplies. Trends of timing for back to school shopping continue to follow similar models for holidays. Some people get prepared for the time more than a month in advanced while others wait until the week of or even weeks after school has begun. 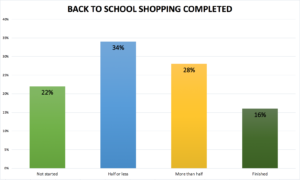 Consumers reported their tops reasons for not completing their shopping as, unaware of items needed for back to school and waiting for deals and discounts. Both categories of students, K-12 and college and graduate students, wait to purchase school supplies and clothing last. Above is a chart averaging K-12 students and college and graduate students shopping habits after the first ten days of August. Over half those surveyed have not completed their shopping, but even more shocking is that 16% of people had finished! You can prepare your store for back to school spending by offering discounts on computers, printers, and tablets. Maybe offer greater discounts for students who bring good grades after the school year – parents will be happy to save, and children will be happy to show off their hard work!